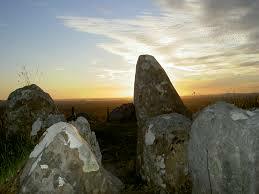 The Magic of Ireland draws us shaman from all over the world to its beautiful, poetic realm. 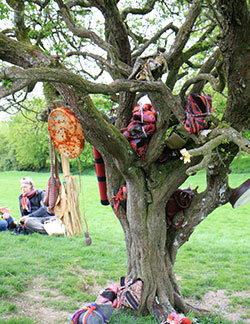 This year Ireland is proud to host the International Gathering of Shaman. Join as shaman from all over the globe journey to the Emerald Isle to meet Irish shaman and share the ancient sites, sacred wells, and faerie trees. Together we will create a mosaic of energy to assist the awakening consciousness of the planet. Bring your artistry, and your courage to work on personal issues. Vision forward into what the world can be, and dance along the threads of energy. Offer heartfelt co-creative ceremony to the Earth, supporting collective consciousness and all of creation. Bring your medicine, your power, and your joy! Take your seat and tend the Global Vigil Fire. Experience the magic weavings of this international cauldron of shamans. The International Gatherings are powerful and joyful experiences, full of laughter and a few tears. People who come feel called to help in the visioning for the Earth and all of creation. Visioning in groups attracts powerful energy from Creation. It is as if all our visions begin to become real, and Creation itself must rise in response, so that all the visions can become part of the new realm. We are sourcing new myths which can assist people in understanding the times we live in. We are asking all of creation to help us, and especially the supporting energies of Ireland. We do this in new and ever-changing ways at each Gathering. Each day together will have a framework, times and places, ceremonial intentions; and yet it will evolve as the day and opportunities present themselves. After the two days on Sacred Sites, we will have three days of Global Vigil Fire. This is the time we bring our visioning forward, using the experiences of the previous days on site. 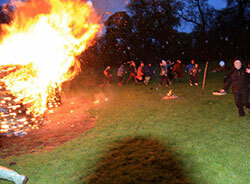 The 24-hour nature of the fire creates an interesting shifting and mixing of different people's medicine. The fire itself shifts with each new pair of Fire Tenders, and throughout the days and nights. The 3-Day Global Vigil Fire will begin on Friday, April 29th, and be tended by pairs from the Gathering of Shaman for two-hour segments of time. During your vigil you will set the tone for the energy, be the only ones putting wood on the Fire, be in charge of keeping the Fire going, and tracking energy around the Fire and from other Fires in the world. During the daytime, there will be events offered from members of the Gathering, who will lead interactive energy medicine experiences. The work at the Fire will then be offered energetically and through creative means to the Fire and the world. All our work for the Earth is done through ourselves. In other words, we do not look outward and try to “fix” problems. We take what we see in the outer world, and go inside to find it in us, healing it there, and then offering the energy of the experience to the world. We hope that anyone reaching for help with the same issues will find the availability and transformation more easily for themselves. Offerings of drumming, songs, dance and more come together from the co-creations of the group. This is collective work, takes advantage of the synergy and creation principles of group intentions. *Our personal connection to Ireland through lineage and past life. We will be sharing in the energy of international peoples with differing experiences. We will be stepping more powerfully into our own personal medicine, which grows out of our foundation of various trainings. We will be taking home an experience that will broaden our journey in unexpected and unknowable ways. Bring your medicine, your power, and your joy! Take your seat and tend the Global Vigil Fire. Experience the magic weavings of this international cauldron of shamans.